Applying pea gravel to seal coat. 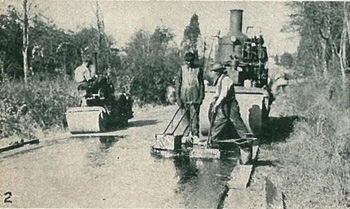 These photographs from a 1923 dictionary show early twentieth century road construction and the vehicles and equipment of the day. 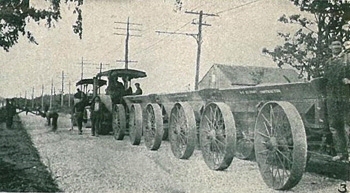 The photographs were entitled as "Newest Methods in Good Road Construction." One photograph is captioned as a "U.S. Object Lesson Road." But what exactly is an object lesson road? 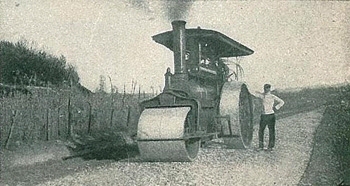 In a nutshell, beginning in the 1800s, the "macadamized" technique of road construction-building the road with layers of crushed stone, mixed with tar that would create a smooth and water resistant roadway-was used as well as other similar techniques. 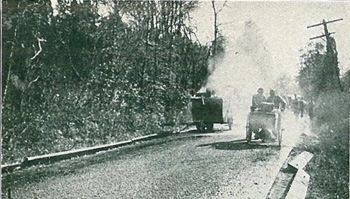 In the latter part of the century, the U.S. Office of Public Road Inquiries (OPRI) hoped the local public would want to adopt techniques to build a better quality road that would be considerably more stable in all seasons and require less maintenance. In addition, a road built by the government attracted more interest and attention than one built by the local authorities. Working from 1897 until his death in 1901, General E.G. Harrison built the first Object Lesson Road in nearly every State east of the Rocky Mountains. He began with the entrance to the New Jersey Agricultural College and Experiment Station in Brunswick, New Jersey. The road was built over a section of the main road by putting six inches of rock macadam into a 660 foot section, eight feet wide. As locals discovered the durability of Object Lesson Roads, the new techniques were adopted. The owners of automobiles in the United States-8,000 by 1900-could now spend more time driving the roads and less time being stuck in a muddy rut. Putting on the seal coat. By the first Survey of American Roads in 1904, two million miles of rural public roads existed, and 154,000 miles were surfaced with gravel, stones, or other paving materials. The Object Lesson Roads were setting the examples. In 1905, the U.S. Office of Public Road Inquiries was renamed the Office of Public Roads (OPR) under the new director, 35-year old Logan Waller Page. Page, born in 1870 in Richmond, Virginia, was a geologist who looked at road building with a scientific viewpoint. He was educated at the Virginia Polytechnic Institute and the Lawrence Scientific School of Harvard University, where at age 23 he was appointed director of the road materials lab. The lab tested thousands of specimens, resulting in Page establishing testing labs in several other States. He also spent some time in France at the French Laboratory of Bridges and Roads, where he learned the French methods of road and bridge building. In 1916, Page developed the Federal-Aid Road Act (with a 50/50 Federal and State matching share) sponsored by his friend and colleague John Hollis Bankhead (see sidebar), a Civil War veteran from Alabama. Bankhead was an advocate of the Good Roads Movement (1880-1916). The movement was initially led by bicyclists, but with the invention of the automobile, it became a political movement. There were still miles to go in the building of our Nation’s roadways. In some communities, the Object Lesson Roads resulted in a slow but steady improvement of common roads; and, in other communities, the establishment of an organized system in road building took place. These roads also demonstrated the use of local and regional materials in road building, such as the use of clay in southern States. In nearly every community where an Object Lesson Road was constructed, some progress was made toward the building of better and safer roads. Tractor hauling crushed stone cars. Decades later, President Dwight D. Eisenhower’s Interstate Highway Program would create 41,000 miles of freeway, using enough concrete he said, ". . . to build six sidewalks to the moon." When he died in 1920 at age 77, John Hollis Bankhead was the oldest man in the Senate. He was survived by his wife Tallulah and two sons. Both sons were in politics. One of his sons, U.S. House of Representative William Bankhead, was the father of American actress Tallulah Bankhead of the 1930 to 1960 era.